Mt. ASO is one of the few active volcanoes in the world. The crater is definitely worth visiting during your stay.The Kumamoto-jo Castle, the beautiful Takachiho area , the Beppu hot spring resort, and Yufuin / Kurokawa hot spring are famous sightseeing spots. 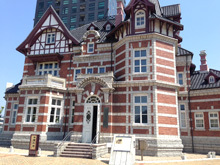 We recommend you to tour around the south Aso area by buses and trains. Fly to Kumamoto Airport, and take a taxi. It takes 20 min to get to our guesthouse. From Kumamoto Station to Higo-Ozu, by JR Hohi Line, 37 mins. From Higo-Ozu to Tateno(Kumamoto), by JR Hohi Line, 13 min. Switch to Minamiaso Tetsudo Line, and go to Choyo Station, 7 min. From Choyo Station, it takes 25 min to walk to our guesthouse. Please refer to the map in one of the photos for directions. The family bathroom and the shower room are FREE. You can use the out-door bath for JPY 300. The soap, shampoo and rinse in the shower room and family bathroom are FREE of charge. Hairdryer and bath towels can be rented for FREE. 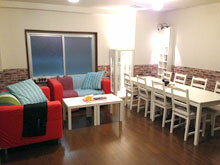 Our dormitory rooms are mix-type, at very reasonable price, JPY1700(web discount price) per night! We also have single twin guest rooms. There are twin rooms available to a single guest, or a group of more than 3 guests. The living room is a common area for everybody to relax. You are welcome to join our dinner party at 7:30pm, at the cost of JPY280. We offer seasonal food cooked by our staff. We also have a hammock, BBQ, camping area.From there, you can take a walk to a secret waterfall. Twin Room with 2 single or bunk beds, sleeps 2 people.